Accessible only by foot, Manuel Antonio National Park is a protected tropical reserve featuring white sandy beaches, lush rain forest and crystal-clear turquoise water. Your full-day tour of this tropical paradise begins with early morning pickup from your San Jose hotel to maximize your time at the park. Stop for breakfast along the way, and enjoy the scenic drive past picturesque villages and the dramatic scenery of the Pacific coastline. Hop out of the air-conditioned vehicle at the park entrance near the port of Quepos. No vehicles are allowed inside Manuel Antonio to preserve the area’s natural beauty and delicate ecosystem. Enjoy an easy, flat hike through the rain forest to arrive at a gorgeous crescent-shaped beach. The afternoon is yours to spend as you wish. Drop a towel and soak up the sun along the beach’s pristine white sand, and cool off with a swim in the clear, warm waters of the Pacific. Wander through jungle trails on your own, or join a guided nature hike to learn about the park’s incredible biodiversity. Be prepared to encounter many wild residents, including monkeys, sloths, tropical birds and iguanas. Get your blood pumping with a hike to Cathedral Point, where you can soak in a breathtaking perspective of the ocean, shore and forest. Depart the park before dusk, and watch a memorable sunset over the Pacific on the return drive to your San Jose hotel. Transportation and meals were very good, although the van was a bit cramped. Tour guide was good, except for when he told us halfway through tbe trail to the park that we had to remember our way back. We didn't even make note of the name of the hotel/restaurant. Our main complaint was stopping at the souvenir shop after a long, tiring day. Our group had to wait an additional 25 minutes for one couple to shop. Our guide should've given a time limit of 20 minutes or so, and should've gone in to get the couple everyone was waiting for. Food at the restaurant was delicious. My trip to Manuel Antonio Park was phenomenal! I was picked up at my hotel in San Jose at the precise time I was told I’d be picked up. The tour-guide and the bus driver were both very informative, friendly and funny. I was able to see 3 sloths along the path to the beach then, once at the beach, I saw several monkeys, raccoons and other wildlife. The beach and the surrounding rainforest were astonishingly beautiful, I didn’t want to leave! At the end of the tour we went to a restaurant with some of the best food I have ever had, this is not an exaggeration! The food was incredibly good! I’ll definitely be returning and I really hope I have the exact same tour-guide again. He made the trip amazing! 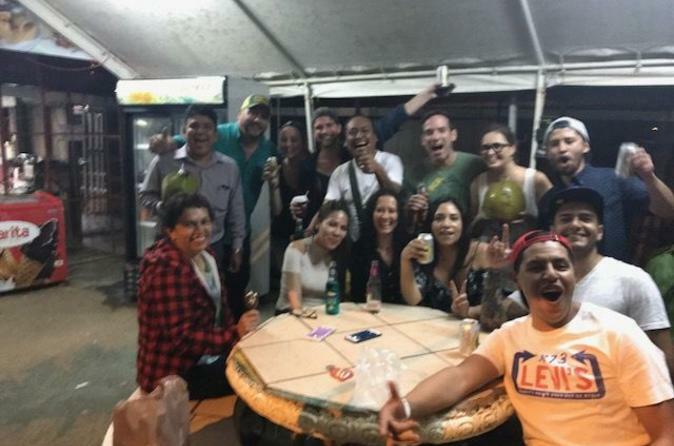 I enjoyed this tour a lot given that Manuel Antonio National Park is one of the best places to visit in Costa Rica. The tour is highly recommended especially if you are pressed for time. 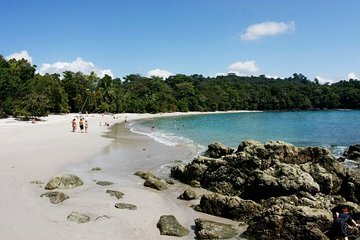 Normally, it takes at least two days to visit Manuel Antonio. Since I am from the Philippines with more stunning beaches, I just went trekking at the National Park. I took all three major trails and leisurely walked for around four hours. It's a different experience because you get to see monkeys, sloths, raccoons and other animals along the trail. The guide was also informative and entertaining! Great trip to a truly beautiful beach. We had a fantastic tour guide - Jose, who took great care of the whole group even though we all were interested in different things. Wonderful breakfast and lunch and the National Park has so much to offer. We were disappointed with this trip from the beginning. When we were picked up, the driver spoke absolutely no english therefore communication was difficult. If we had not had a member of our party who spoke spanish, we would have had no way to understand him. Once we got to the park, we were surprised with an additional fee of 30 per person for a guided tour which we did not expect nor was this mentioned in the description. Basically this was 140 for a ride to the park and the 16 it cost to get into the park for a self walking tour. Everyone in my party was very disappointed. Very long day of driving, but the stops along the way were well selected. Although this tour starts out very early in the morning it is well worth it! The drive is long but hey, I wanted to see Costa Rica and our tour guide, Carlos was very informative. About an hour in, we stopped for breakfast, which was very tasty and well prepared. After that we drove another 30/40 minutes or so and stopped a local gift shop. It was reasonably priced items and well worth stopping for. We proceeded to the park and they stopped by a beautiful scenic view to take pictures. When we got to the park, they gave us a very good small sub sandwich and water. Then he gave us the options of going directly to the beach or take the rain tour and then go to the beach. I opted for the tour as I live by the beach back home. It was very informative and he was definitely on the lookout for any animals. We actually didn't see any monkeys until we got to the beach, their home. LOL Carlos also told us about the 3 point look out which you could go up to see and it is definitely a hike up, so be prepared. Now here is where we encountered those lil spider monkeys. Try not to be afraid of them although they seem aggressive. The points were a beautiful spot to take pictures of the ocean. Once we made it back down, we decided to lay out at the beach. Well this is where those monkeys get aggressive. I didn't have any food in my bag however, I had pulled my towel partially out of my bag. My friend was watching my bag, so she had her back against the trees, well one came up and started to grab my stuff. She ran away and another person on the beach shewed him away. So we moved further down the beach thinking if we were away from the closes part of the forest, they would leave us alone. Well they did but then we had an encounter with 3 raccoons. They are easily shewed away if you are aggressive with them. After our beach time was over, we went back to the restaurant where we were served a delicious lunch which we had great options prior, to choose from. The service was impeccable and with the cost of the tour, it was surely every pennies worth. I highly recommend this tour and just be prepared, it is a long day. We were lucky that it was during the week and the traffic wasn't as bad. They did say it has sometimes taken twice the amount of time to get back due to the high volume of traffic and the day of the week. Excellent. Very enjoyable trip. The bus was comfortable and air-conditioned. We were given the choice of walking through the forest before spending a few hours on the beach or walking straight through to the beach for those wanting to spend more time on the beach. We started with breakfast then a snack before the walk in the forest and lunch after the beach and before heading back to the hotels. The park was amazing! Be prepared for challenging walking elevations, even to and from the beach. There are many path options to walk, or enjoy several beaches. The main beach is definitely the best! There are many animals to watch and they are very friendly. Keep an eye out for raccoons and iguanas. We considered staying in Jaco, but instead settled on taking several day trips from San Jose. This was worth it! It was a full day, but there were meals included. They are very accommodating and picked us up from our hotel in Escazu. The park was beautiful and we enjoyed seeing the animals/relaxing on the beach, but this trip was 75% bus ride. That may be due in part to the traffic that day, but 11+ hours in a van for 4 hours of excursion was tough. Parts of the trip felt disorganized and we spent a lot of time waiting around.